What do I get with the Kimura Trap System? DVD 1: Kimura Fundamentals 1 – The core essentials on how to the Kimura, covering grips, positions, and basic setups that must be understood before utilizing the Kimura Trap. DVD 2: Kimura Fundamentals 2 – More simple, yet effective setups that will allow you to fully realize your Kimura trapping potential! Even though these are considered basics, I haven’t met a black belt yet that knew all of what I consider the basic techniques. So even if you are a veteran grappler, you will want to pay close attention! DVD 3: The Kimura Trap – The introduction to the concept of the Kimura Trap. It covers one setup of the Kimura Trap, and all the possible transitions and finishes you can utilize. This one segment can change your grappling world forever – it has for me and many others such as BJJ stars Keenan Cornelius and Nyjah Easton. DVD 5: The Kimura Lock Down – The cousin of the Kimura Trap, the Kimura Lock Down is a powerful attack position that can be initiated off your back from guard, half guard, or the open guard. Best of all, it flows with the Kimura Trap – allowing you to switch back and forth between positions. DVD 6: Kimuras from Behind, and Escape Prevention – Yes! Even when your opponent is behind you the Kimura Trap is still in play. Whether you are standing, on your knees, or even in a complete back mount with hooks in, you can still finish the Kimura Trap! Plus, we plug any holes that your opponent might try to escape the Kimura Trap from, so that once somebody gets caught in the Kimura Trap, there is only one escape – to tap out! The total running time of the DVD set is over 4 hours, and is filled with priceless nuggets of information that you can’t get anywhere else. 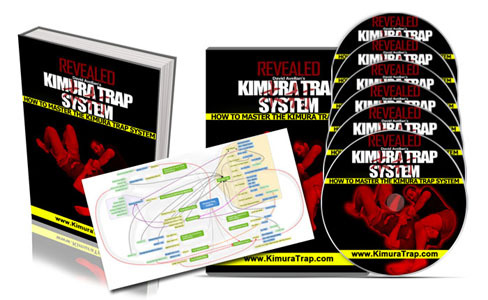 On top of the 6 DVD’s you will also get the Kimura Trap System Mind Map. This chart will show you how each move connects to each other, making it a great drilling reference to really get the most out of your Kimura Trap game. Is there a Kimura Trap Book? When the Kimura Trap System was first released, it came with a full color book. However, since the system was first sold out, it was never reprinted. But I have good news! I am now offering an eBook along with the DVD set and the Mind Map. The eBook is over 100 pages long, clearly illustrated with pictures in color. It goes over everything the DVD set has to offer, so it makes a great training companion for when you get stuck at the gym. It can opened on all mobile devices such as an iPhone, iPad, or Android phone or tablet. Is there a new version of the Kimura Trap System? The Kimura Trap was released on August 2012, and since then the system has evolved. I have made tweaks to certain techniques, discovered new ones to add on, and found ways to increase pressure and leverage to maximize the finishing potential of the Kimura Trap. I have held several webinars to share this updates with people, but I am going to do something even better – offer updates online for free! Through my MMA membership site, FFAcoach.com, there is section devoted solely to the Kimura Trap System. Any updates made to the system will be uploaded and be available to everyone who orders the Kimura Trap System at no additional charge. So now you will always have the latest version of the system at your disposal. As of May 18th 2016, we have an additional 45 minutes of techniques and revisions currently online. Is there a digital or online version of the Kimura Trap System I can access through my mobile or tablet? Yes! We now offer an online version of the Kimura Trap System through our MMA coaching portal, FFAcoach.com. When you order the Kimura Trap System, you will get both digital and DVD copies of the system. You can access the online version through any computer, mobile device, or tablet as long as you have an internet connection. Is it available to order now? What payment methods do you take? Can I use PayPal? Yes we take PayPal and major credit cards such as Visa, Mastercard, Discover, and American Express cards. If you cannot do either of these, contact me at David@DavidAvellan.com and we can make special arrangements for you. It is real simple. If for any reason you are not satisfied with the Kimura Trap System within 30 days, send me an email telling me why you did not enjoy it and pack everything back in a box and ship it back to me. Once I receive all the items, I will give you a full refund. Yes we do. We can ship it to anyone with an address. We have sent packages to all over Europe, Russia, Japan, China, Australia, Africa, Hawaii, and even a small island off the west coast of Africa called Cape Verde. So yes, we can send it ANYWHERE. Once your order is completed, it takes 1-2 days to process before shipping out. For US orders, shipping can take 3-5 business days. The average order usually gets delivered within 4 days after ordering. Your order will also have tracking, so you can monitor your packages progress. For international orders, it can take from 10-25 business days. Unfortunately, there is no tracking available for international orders as I wanted to make shipping as affordable as possible ($10.95 for international). Rest assured that virtually every package I have shipped has made it to it’s destination. Out of over 900 orders, only 2 of them had shipping problems. If you have the misfortune if not receiving your package after waiting 25 business days, I will make sure you receive it at no additional cost to you. I don’t like watching DVDs, I am impatient, and shipping in my area is unreliable. Is there an online version of the Kimura Trap System course so I can get instant access without any hassle? Yes, there is. When you order the Kimura Trap System you will get both the DVD set and online access to the Kimura Trap System. So no more waiting woes – you will have instant gratification that you can carry with you anywhere that you have internet access! Why should I get the Kimura Trap System, when there are other instructional courses covering Kimuras? There are many wonderful instructional DVD sets out there. I would never discourage you from investing in your education, so by all means seek out knowledge from wherever you can. If you are on this page though, that means you are looking for something special that you cannot get anywhere else. The Kimura Trap System is truly a one-of-a-kind submission system that is only listed in it’s entirety here. You might be able to find bits and pieces of it online, but no one else has put together such a simple step-by-step system. I have had people from all over the world send me videos of them using the Kimura Trap system. People have won world championships using my system, such as Keenan Cornelius, DJ Jackson, and Jason Soares. It has been tested in the highest levels of competition, and passed with flying colors. Furthermore, it is a system that can be used by anyone. You don’t need to be long and tall, short and stocky, flexible, powerful, or a black belt to use it. You can be a beginner and use the Kimura Trap. It also will tie in with any type of game, whether you are a bottom guy, or a top guy. The one thing this system will do is make you a finisher. You will find yourself getting more submissions than you ever did before. That is what it did for me and I know it can do it for you too! I am still on the fence about ordering the Kimura Trap System. What else can you offer me? 1 – You can join FFAcoach.com for only $1 for 30 days as a special trial offer. On FFAcoach, you will get access to our video library of over 1000 videos (and growing every month by 30 videos on average). You will get to see how I teach, train, and coach at my home academy, the Freestyle Fighting Academy. We have monthly curriculums, plus we have videos of our classes, sparring, competition, and much more. After watching all those videos you will have a good idea of my teaching style and martial arts pedigree. You will be able to make an informed decision as to whether I am worth investing in. 2 – Take the plunge and Order the Kimura Trap System now!